After months of reading inactivity due to vacations, final exams and family gatherings, I finally buckled down to read. I started reading Crossed, by Ally Condi – Book two in the Matched Trilogy, and I’m about 3/4s of the way through it, but as life events and work struck hard this spring, I had to put a pause to it. Instead I turned to my video games for more mindless entertainment, and after eating those empty calories, it was time to return to my diet. I figured the best way to get myself back on track was to propose a deadline. Since I’m out school for now, a deadline is the last thing I needed. It seems as though my Book Club hasn’t had the best luck either. Perfect opportunity! Hosting June’s meeting would not only allow me to select a book, but also adhere to a deadline — I can’t host a meeting if I haven’t read the book! 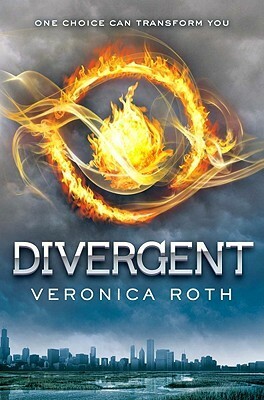 Club members cried out for a Young Adult book… This month’s selection: Divergent, by Veronica Roth. A la Hunger Games, Divergent is about a strong young girl, living in post-war(/apocalyptic?) Chicago sometime in the future. Oh, and of course it’s a trilogy. No love triangle though! (Not yet anyway. Just one boy for now.) The surviving society has split itself up into five different factions. Each faction blames the cause of the war on a particular human flaw, such as ignorance, cowardice and greed, and bolsters the virtues opposing them: intelligence, bravery, selflessness etc. Sounds very Seven Deadly Sins, and part of me wonders why Roth didn’t just come out and say that’s what she was doing, but it didn’t bother me too much. At the age of 16, society members so through a (sorting hat) ceremony where they are presented with what faction they would be best suited for based upon their aptitude test (how well they do in a virtual reality video game 😛 ). Despite their results, they are free to select whichever faction they want. The rest of the book, revolves around Tris’ initiation into the faction of her choosing and discovering that there are some secrets between the factions… SPOILER!! : Controlling the masses! WHAT?? You don’t say! All in all, the book was a very quick read. At first I was really frustrated that the main character had ZERO personality, but after about 40 or 50 pages (which seems to be a trend with books lately… Entry on that later) she becomes someone who I actually cared reading about. I appreciate the gradual development of her character through the plot of this first book, and I’m interested to see how the rest of the series is handled. And it was an amazing pick! Perfect to get us back on track! !